Google Universal Analytics (GUA)is a free Web analytics service. They provide statistics and basic analytical tools for search engine optimization (SEO) and marketing purposes. The service is available to anyone with a Google account. 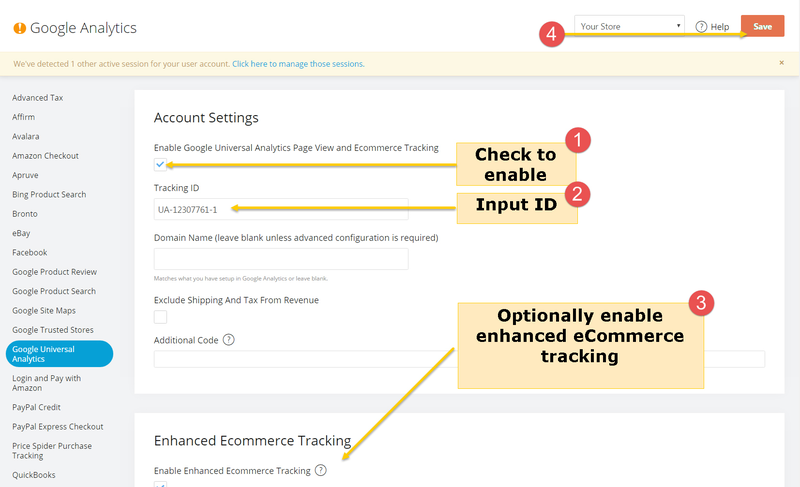 The following walkthrough will help you sync it to your store and show where it needs to go in the back of the admin panel. The tracking ID for Google Universal Analytics looks like this: UA-71237761-1. You may have already come across yours. If not, Login to your (or sign-up for) a Google Analytics account -- Refer to Google's documentation to obtain your tracking ID. Once obtained, keep it handy and proceed to Step 2. Results show within 24hrs or sooner depending on the processing time at Google. The generation of the order data on our side happens as soon as the script is placed and new orders are placed.